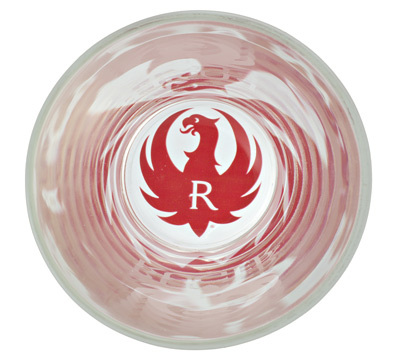 This 16 ounce, 5.75" high glass has the Ruger logo etched on the sides and a red eagle on the bottom of the glass. Made by Adirondak. I bought a set last year and love them. I am ordering a couple more sets for gifts. Have had the pint glasses since they came out, no harm in dishwasher they look great. I was surprised when I received these glasses in the mail and found out that the logo on the bottom of the glass appears to be some kind of sticker stuck to the bottom. The glasses look cool, but I am wondering how many washings the stickers on the bottom will be able to withstand. 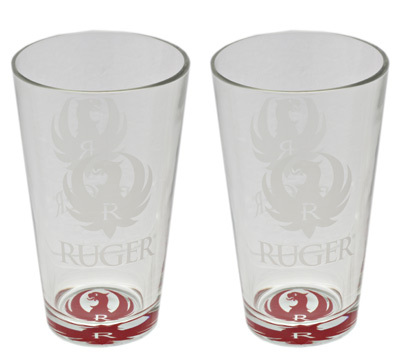 These glasses are awesome - what a cool design idea, having the logo on the bottom of the glass!